The ponderings of Andrew, Anthony, Jesse, Meg, and Robb on the issues and dilemmas of the church today. We are seeking to make church relevant and available without marring or distorting the precious and life-saving Gospel that has been given to us. Which Christian denomination to you most associate yourself with? "God grant me the serenity to accept the things I cannot change, the courage to change the things I can, and the weaponry to make the difference." Hebrews 4:12-13 - 12 For the word of God is living and powerful, and sharper than any two-edged sword, piercing even to the division of soul and spirit, and of joints and marrow, and is a discerner of the thoughts and intents of the heart. 13 And there is no creature hidden from His sight, but all things are naked and open to the eyes of Him to whom we must give account. I often find myself thinking about doing something - telling a "small, white lie", taking a quarter (that isn't mine) from the kitchen counter, laughing at something evil - that doesn't seem so bad, and telling myself the no one will know. There are bigger, worse things that I do as well. Have you ever noticed, too, that it is hard to read the Bible when we are sinning a lot? If I run across a Christian who is deep in sin and ask them, "Have you been reading your Bible lately?" the answer is almost always "no." If they do answer yes, I give them a stern, unbelieving look - you know the one - and they almost always fold. The reason it is harder for us to read the Bible when we are in sin is because of the power it has. "For the word of God is living and powerful, and sharper than any two-edged sword, piercing even to the division of soul and spirit, and of joints and marrow, and is a discerner of the thoughts and intents of the heart." Have you ever had a sword slice through you? That is what the Bible does to us spiritually when it reveals the sin in our lives. It hurts us, and thus when we subconsciously know it will hurt us to read it, because we are in sin, we make excuses to avoid it. I am asking you to think about this. Is this what you do? Does the Bible reveal faults in your own life that you don't want to face? If so, you must not turn from the Bible but rather turn towards it! Let those things be revealed so that you can fix them, and therefore become a better servant of the Lord. 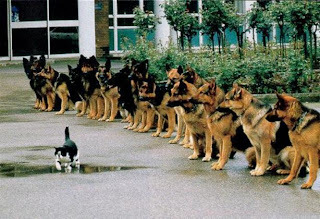 Challenge of the Week: Be Courageous! I've heard before that the one thing people fear more than death is public speaking. I've also been told that grape jelly tastes good on chicken. Whether either of these things are true, I am not sure - I will note that I'll never test the latter, though. Grape jelly on chicken? Seriously? We have a lot of things we can be afraid of. One of my biggest fears is misquoting the Bible - using the Word of God to suit my purposes, rather than God's. I also am always afraid when witnessing. There have been many times where I have felt the Spirit telling me to tell someone about God, to talk to them, and I have walked away, giving myself one of many excuses like, "Well, the person looked busy," or "That's a girl. I can't witness to a girl." I've also been afraid when the world seems to be boxing me in. Bad stuff just keeps happening. I can't get a job. My grandfather just died. I get a huge bill from my student loan in the mail. Some of my old friends want me to hang out with them again, those friends who were a part of my life before I changed. When stuff like tis happens, it just always seems to feel like the world is crashing in on me, that someone or something is out to get me. When all this happens, my first reaction is to blame someone else. God is an easy one to blame, "God, why do you let all of this happen to me!" Or I blame my parents, "If they had raised me better, given me more chances, this wouldn't be happening!" You know what I've found blaming someone does? It distracts me from overcoming my fear, from getting past those issues or problems in my life. It takes my focus off God, and His Word; the one book that has the answers I need. When we come to a situation that we fear, such as witnessing or making an important choice, they often are like huge, rocky mountains that can't be climbed. When things start happening in our lives and just keep piling up, and we have not idea what to do, and it seems like we are being boxed in from all sides; that's like being in a boat in the middle of an ocean, and it is raging wild - the boat is tossing and turning and we don't know what to do - we are afraid. Pslam 16:8 says, "I have set the Lord always before me; because He is at my right hand, I will not be shaken." All of the mountains in our lives are smaller than God, no matter how big they may seem. When we put the Lord before us - when we focus our eyes on Him (by staying in the Word, praying and worshiping), He we lead us through those mountains. Whether He does so by moving the mountain, taking us around it or showing us the way up the mountain, He will get us past that feat, that mountain in our life (Matt 17:20). In Mark 4:35-40 we read how Jesus calms the storm on the sea of Galilee. In the same way, God has the power to calm any storm that is causing the sea to rage in our lives. And sometimes the storm won't calm all the way, but Jesus will keep us safe until the seas settle once again. If you are going through times of trouble, or find a fear in your life that looms above you like a giant mountain, focus your eyes on God and follow the path He sets for you. Know that as a Christian, He is always with you. 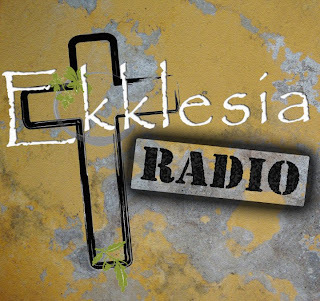 Another Ekklesia Radio broadcast is over, and we are very excited about this episode. Andrew, Anthony and Robb were the hosts this week and talked about the common things in today's Christianity that we often do that are not totally scriptural. We talked about platitudes (those sayings like "trust in Christ" or "God never gives us more than we can handle" or "Just pray! ", Christian witnessing and all those cool, good things. Listen! Comment! Like! Love! Whatever! If you asked me what one thing had the biggest impact on my life, I would say friends. Here is why. When entered high school I was young an innocent and very naïve and I had just transferred from a Evangelical Christian School, a private Christian school, to Riverdale High School, a stereotypical redneck school. And I was your classic prep school graduate who liked video games and reading, so it could be said that I wasn't exactly well known among this crowd. So it was only natural that I was a little desperate to make friends. Unfortunately I was not very discerning about who I became friends with. So I made friends with just about anybody that would talk to me... and pretty girls. Whats so wrong with this you ask? This is how friends are made, you say, well just listen. Like I said I was the innocent and naïve one, and it showed. In fact it was so bad, that I was told I shouldn't curse because it sounded wrong coming out of my mouth. So my friends, being so kind and considerate, decided to take it upon themselves to corrupt me. Hence began their campaign to dirty my thoughts, pervert my speech, and sour my mood. Soon I was listening to Green Day's Boulevard of Broken Dreams, cursing like any other high school student, and had become talented at crafting dirty jokes. Exactly the kind of person you would expect a son of God to be, right? The problem was that I didn't head the advice of Psalms 1:1 - Blessed is the man who walks not in the counsel of the wicked, nor stands in the way of sinners, nor sits in the seat of scoffers; - These people were not people of God and where not concerned with Him nor His statutes an where thus evil people. It was in there counsel I walked, I stood among them, and I sat in fellowship. I partook in there deeds, as they would partake. Now I live with the consequences. What they did to my mind can not be undone only subdued. But there is a flip side to this story. I now have great friends, who love God and encourage me in my walk with God. They keep me focused on God and confront me when I am in sin. These are the truest friends I have ever had in my life. They are legitimately concerned with my well being, not how far into depravity they can pull me. Instead then pull me into righteousness by being righteous themselves. These are the types on friends you should have. So what now? What should you do with your depraved friends? I wish I could say that the best thing to do it to dump all the bad influences in your life and marginalize friends who don't care about God, but I personally know that sometimes this isn't an option. For example, I have a friend whom if I were ever to abandon would curse God and my religion. Its a catch twenty-two, if I remove the this person from my life I would tarnish the name of the One whom I am trying to worship by leaving this friend. So I can personally attest to the fact that it is never as easy as it sounds. So I give you this advice, put your Godly friends above those who are not, but do not abandon the others, pray for them and witness to them, so that one day they might become a friend that is as close as a brother. I did it this morning, in fact. It happened while I was listening to one of my favorite podcast; the subject was morality. They were telling a story about primates and how they settle arguments in the end it was concluded, with enough evidence to compel me, that primates have a sense of morality. It had always been my belief, though I won't go into the details now, that the one quantifiable quality that separated us from our animal friends was the ability to understand right and wrong as is seemingly stated in Genesis. I was wrong. Right then an there, like a swift punch in the gut, doubt exploded in my mind. How can primates know the difference between is right or wrong? And yet there it was, proof that they do. How can this be? The sting of doubt is one that is familiar to us all. At some point in our lives we will doubt God and religion. We will read something, hear something, or experience something, that will bring doubt racing into our vulnerable minds. If you try to prevent it you will fail, it is a fact of life that doubt will come. Like a weed it will grow rapidly and fill your thoughts and try to choke out your faith. So how do you fight it? Well sort of. After hearing that story about the moral capacity of primates, I was filled with doubt, but I used that doubt to fuel my search for answers. I began to dive into science articles and news reports and found a few very exciting fact. Humans are the only animals with the capacity for moral judgment. The primates have only instinctual understandings of morality. (I will be talking about this experiment in a later blog) As soon as I learned this that cloud of doubt disappeared. Replaced by a stronger faith and greater understanding of God and the universe he created. Doubt doesn't have to be evil, sometimes it can be the very thing that leads you into a deeper relationship with God. If you ever doubt your faith in God, or anything for that matter, just use that doubt to fetter out the truth and then be even stronger in your beliefs. James 4:7-8 - 7 So humble yourselves before God. Resist the devil, and he will flee from you. 8 Come close to God, and God will come close to you. Wash your hands, you sinners; purify your hearts, for your loyalty is divided between God and the world. Why do we tun to God for somethings, and not in all things? Why do we try to live our lives on both sides? We must wash our hands of all evil things, so that we can give our loyalty to only God. When you go throughout your day, think about the things that you are doing. Are you submitting (humbling) yourself to God or to Sin in that situation? Are you resisting the devil, or allowing him to have a say in your life? Think about this. Anthony's Challenge of the Week: Be Encouraged! Sometimes I spend hours upon hours trying to think of a story or a situation in my life that I can use to help illustrate a point I want to make. Ask pastors/reverends/ministers about it. Ever notice how they always seem to have a story that fits? Sometimes I just can't think of a good story to fit my point, and it takes forever. This week I didn't have that problem, because I can think of hundreds of times I have been in need of encouragement. Every one of us has those stories - times when we were broken and tired physically, emotionally and spiritually. 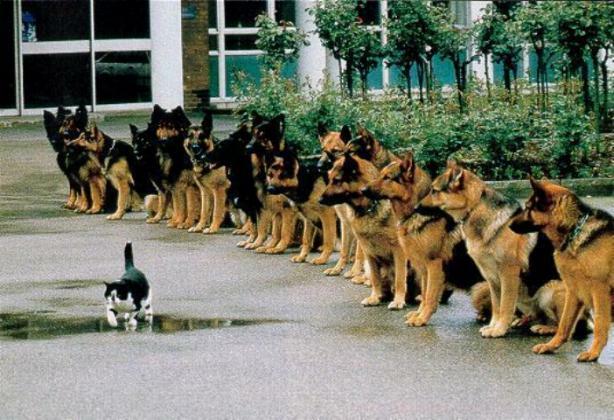 Sometimes we tell ourselves: "If only someone would encourage me. If only someone would give me a boost." Sometimes things happen - sometimes a lot of things - that seem to drain us. The death of a family member, the "big breakup," losing a job or a hundred other things. These things almost always seem to just pile up an accumulate, and we just don't know what to do. We just... need something, some one. I like to consider myself pretty close to God. I have a long way to go, no doubt about it, but the Big Guy and I have a pretty good relationship. That being said, sometimes it is just hard to turn to Him for help, for support. In fact, the more discouraged I get, sometimes the harder it seems to focus on God. It is like the discouragement has clouded my vision, making I hard to see the truth I know. crushed in spirit. A righteous man may have many troubles, but the Lord delivers him from them all. God is and will always be the ultimate encouragement. Know this: That no matter what happens, how terrible things seem to be turning and how much you think you can just not do it on your own, God is there! He is close to the broken hearted - it is as if when you hand fallen, he kneels next to you, holding His hand out in an offer to help you out. Sometimes it is hard to see that hand through the tears and the pain, but He is there! Accept the hand! Not only that, but God has given us other Christians. The Bible tells us that we are all members or the same body, so when on part is hurting, the whole body feels the pain. We are to help and support and encourage each other. One of the kindest things someone had ever done for me I remember as clearly as it was yesterday. I have and will always be praying for you. Love, One who also struggles"
I didn't start crying, but I had wanted to. The note seemed to open a flood gate that I had built in my heart. That night I went home and spent a long time praying, giving my burden to God. I had heard that verse before, had known it... but for some reason, being reminded of it by a fellow Christian just broke me down. The following day was my first day free from the slavery of the despair I had been experiencing. It was the first time in what seemed like months my spirit was renewed. If you are at a point where you are doubting or experiencing a situation where you are discouraged know that you are not alone. You do not have to struggle by yourself. Not only do you have the body of Christ here to support and love you, but you have the creator, the Father - God. Be encouraged! Be encourages because, no matter what you are going through, God is right there to help you. Be encouraged because, whether or not people of this world acknowledge and thank you for what you do, God knows. So don’t grow tired while doing good! Be encouraged because you have a body here on Earth that is going through some of the same things you are – you are not alone. That is where despair comes from, the thought that we are alone – but we aren't. 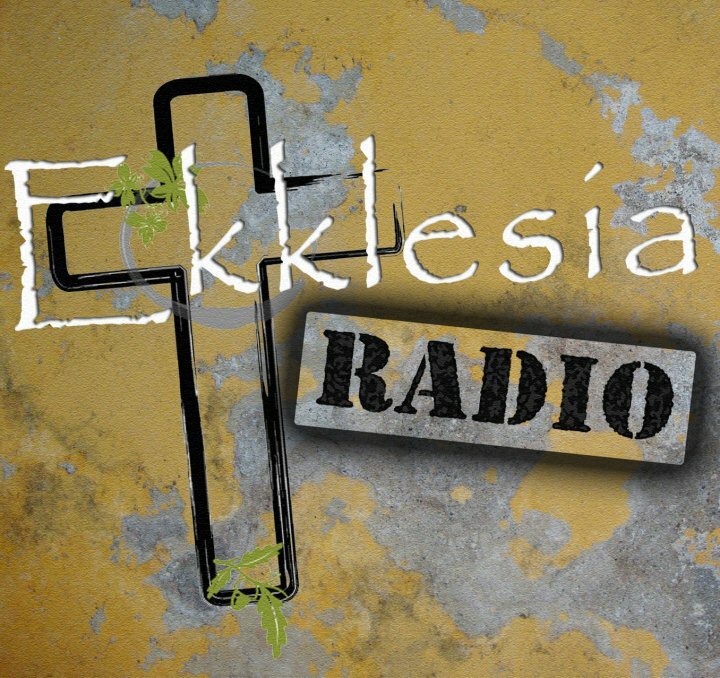 On tonight's show (May 6, 2010), we are discussing four verses that are of specific value to the founding and establishment of the church and the foundation of our faith in the Lord, Jesus Christ.The passage that I have been assigned to discuss is that of Ephesians chapter 1, verses twenty-twoand twenty-three, in which we find the Father crowning Christ as the head of the church, ruler and chief executive of all things pertaining to ministry, doctrine, fellowship, and the like. I'd like to discuss what this passage means to us, both as a corporate body of believers, and also as individuals who seek to honor Jesus Christ as King of Heaven and Earth. And he (being the Father) put all things under his (being Christ) feet and gave him as head over all things to the church, which is his body, the fullness of him who fills all in all. Before I get into what this verse means, in particular, to the church, I'd like to give a little context to the passage in order to enlighten you to the full magnitude of what the Apostle Paul is saying. Paul, here, is writing to the church at Ephesus and, in a very Pauline way, he introduces his intent for writing this letter with a series of exhortations to the church. In this passage, Paul is giving credit to the Ephesian church members for their faith as well as qualifying their faith by making the above statements. In the surrounding verses, we see that Paul is building a case that the power and authority of Jesus Christ originates in God, the Father himself. Beginning in verse seventeen, we see Paul unpack the idea that it is the Father through whom all wisdom, knowledge, enlightenment, hope, and power is derived. Even that power, Paul says, that raise Christ from the dead, was from the Father. Therefore, the Father, being authority embodied and power personified, has given to Christ that very same authority and power, and has named him, as verses 22 and 23 state, head over all things to the church. So, believer, what does that mean for you? What does that mean for us, as a body of believers? Well its simple, Jesus Christ is in charge. "Well, of course he is," I'm certain you're saying or at least murmuring in your mind. But how many times have you stopped to think about the magnitude of that statement? How many times have you contemplated the full capacity as to what Paul is saying here? Let's look at what this means to the corporate body, the church as a whole. There are many levels of authority in the church. Beginning at the bottom, there are those who have been given the stewardship of being a 'deacon' or a servant of the assembly. These men answer to elders, and elders, depending on the organization of the church, to the pastor. The pastor then, on behalf of all of the people in the congregation, answers directly to Christ himself, on all things, and especially on the issue of teaching. The pastor is recognized by God as an under shepherd, and is responsible for the stewardship of his 'flock'. That means that the pastor will answer to Heaven for his own sins, as well as those sins committed by others that he has not confronted biblically, and for the solidity of his teaching and doctrine. This a huge responsibility, and answering to the King is much like answering to the President of the United States or the C.E.O of any large company. Now, that may sound largely negative, and, if the church is acting as the church should, it is a negative. Yet, on the individual level, there is a great comfort in knowing that Jesus is the coach, he's in charge, and nothing goes on without either his approval, or his chastisement. Remember that this is the same Christ who humbled himself, took on the flesh of a man, and willingly went to the cross to die. This is the same Christ that heals the sick and casts out demons, and again, all of this power is given by the Father himself. Unlike the President or the head of some multi-billion dollar corporation, Jesus Christ cares about and loves each individual deeply and has given to us the very power he's been given through the Holy Spirit and through the divinely inspired Word of God. With that, we can speak and live with the authority and power of the Father himself. Finally, let me say that the authority of Jesus as being the head of the church is not some magical, spiritualistic, ethereal fairy dust that falls upon the shoulders of a few men in certain positions. He is the King and he governs by a divine decree which is, as a matter of fact, written down for our benefit and his glory. The Word of God is the standard by which all things, living or dead, true or false, good and evil, are judged. It is God's Word that sustains the long reaching arm of God, and through the purity and righteousness of Christ, it remains the very backbone of his authority. Test every spirit to see whether it is from God or Satan. It is your responsibility as an individual to check, double check, and triple check whether what any pastor, elder, or deacon says or teaches is truth or heresy. If it cannot be backed by scripture and is not compatible with the nature of the One True God, it should be regarded as filth and cast aside. That is the power and authority given to you through Christ, the head over all things to the church.